When Katsuhiro Otomo's anime masterpiece came out in 1988, it changed a lot of people's lives — mainly because until they saw Akira, they had no idea that animation could be used for anything other than children's entertainment. More than 25 years later, this tale of teens in Neo-Tokyo who run afoul of a militarized government and a secret experiment to unlock telekinetic abilities may have lost its shock, but not its power. Although purely Japanese, Akira's tale of how modern society disenfranchises and co-opts youth into its faults and machinations is universal. As a child, Hayao Miyazaki wanted to be a manga artist. But after he became the most acclaimed director in anime, he only chose to adapt one of his works into manga — that being Nausicaä of the Valley of Wind. The post-apocalyptic fantasy is set in a world so ravaged by war that nature itself has risen up and created giant bugs called Ohmu to begin the slow process of purifying the planet while the remnants of humanity begin another slow, maddening descent into war. 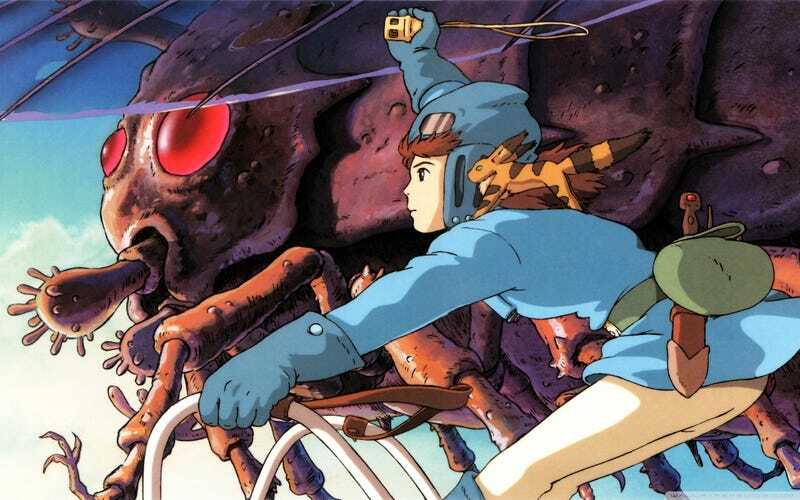 Nausicaä isn't so much a love letter to nature as it is Miyazaki's apology for man's foolishness, destructiveness and blindness, although it's one that still has enough optimism to hope that we can see the error of our ways before it's too late. A bold, brilliant reinvention of the giant robot genre. An examination of the id, the ego and superego. A massive exploration of Freudian psychology, Kabbalism, and the nature of the soul. It might be easier to explain what Evangelion isn't about. But despite decades of the most crass merchandising possible, Hideaki Anno's anime masterpiece still resounds with viewers of all nations and ages because of its primal storytelling power. Whether you accept the optimistic but troubling self-actualization shown at the end of the TV series or the movie's far more nihilistic conclusion, one cannot watch Evangelion without being changed in some way. Although Spirited Away won Miyazaki an Academy Award, his truest masterpiece may be My Neighbor Totoro. A deceptively simple tale of two young sisters who move out to the countryside and discover a magical world of giant "dust-bunnies", catbuses, and more, Totoro knows exactly how a child views the world, and presents it with the perfect amount of joy, wonder and mystery. It is impossible to watch My Neighbor Totoro and now remember how it felt to be truly young; and if you're already young it's impossible to watch the movie and not be mesmerized. And then want to own at least one stuffed Totoro. When Masamune Shirow began putting out his cyber-police adventure Ghost in the Shell in 1989, it was hardly considered a masterpiece. But now Ghost in the Shell has become one of anime's most popular franchises, and that's thanks to Masamune Shirow's dark (one might say dour), trippy, brilliant 1995 movie adaptation. Where Shirow's manga was content to examine how technology and the internet would change crime, Oshii used cyborg protagonist Motoko Kusanagi to examine the meaning of life and consciousness in a world where the virtual was as legitimate as reality. Ghost in the Shell has inspired countless imitators, especially in anime, but none of them have had the effect or the staying power of the original movie. Whether you're a fan of the original Japanese anime Super-Dimensional Fortress Macross or Robotech, the Americanized adaptation cobbled together from it and two other anime series, the fact is the Macross saga remains one of the greatest love stories of the 20th century. Only Macross is willing to show love in all its forms — the way it brings joy, the way in brings pain, the way it brings sadness, and the way it brings insanity. I've said it before and I'll say it again: Love is what makes the commander of the most powerful spaceship in the galaxy, Lisa Hayes, wash the underwear of a lowly Veritech pilot, Rick Hunter, while he's chasing about an underage Chinese pop star named Minmei, who toys with Rick mercilessly while she pines for her cousin Lynn Kyle, who throws gin bottles at her. THAT'S LOVE, PEOPLE. And Robotech helped an entire generation understand love's messiness, even if we were all still powerless before it. Strange, surreal, bizarre — this barely begins to explain how weird FLCLis. This 6-episode OVA series was created by Kazuya Tsurumaki, who decided to throw everything he thought was cool into a single anime — baseball, bass guitars, Vespa, robots, and the Japanese rock band The Pillows. What he managed to create, though, was one of the great coming-of-age stories period, as 12-year-old Naota deals with the violent arrival of an alien girl named Haruko in his life and giant robots sprouting from his forehead. It's not especially subtle, but that doesn't make FLCL any less powerful or any more entertaining as Naota experiences the confusion, danger and excitement of growing up — via robot fights, girl troubles, and occasional beatings by Haruko with her bass. Also, it's really, really cool. More experimental and surreal than most of the anime on this list, Lain seems to trod where Ghost in the Shell does — about the relationship between consciousness and technology in a world where a virtual network called the Wired connects humanity. But Lain isn't as interested in technology as much as how communication and perception create Lain's identity — whether it's how she perceives herself or how other perceive her. There are multiple Lains in the Wired, all different aspects of her own personality, and not all working for her; but Lain's sense of self is also informed by what and how she presents herself to others, and how she communicates with them. Eventually, Lain recognizes her powers to control reality in the Wired, and essentially erases all memories of herself. Lain is troubled, yes, but the show's exploration of self, loneliness and perception is only more powerful for it. There have been countless films about war — the cost of the war to those fighting in it, the cost soldiers pay when they come home, the cost to their loved ones. But no movie ever managed to show the cost of war to the completely innocent — namely, a 14-year-old boy named Seita and his younger sister Seita — who starve to death as a result of World War II and the actions on both sides of the conflict. Arguably one of the saddest movies ever made, Grave basically watches these children lose their mother, get ignored by relatives and other adults more concerned for their own welfare, and then slowly, inexorably, needlessly die. It's the truest horror of war, shown uncompromisingly, and with no other desire than to make the viewer feel this pain, this loss — in hopes that it may never have to happen again. Most of the late Satoshi Kon's works examine the nature of reality and fantasy, and the thin line separating the two. But the director's first film, Perfect Blue, does so in a manner more subtle than his other films, creating an unusual masterpiece that honestly could easily have been filmed in live-action. 1997's Perfect Blue is about a pop star named Mima who decides to become an actress, but a series of murders where she appears to be the prime suspect — murders that echo the movie she's starring in — loosen her hold on reality. It's the Hitchcock film Alfred Hitchcock never made, as Mima tries to discern what is life, what is the movie, and what she has or has not done. The movie is actually more powerful for refusing to utilize animation's possibilities, and keeping it "realistic" — the more seems both more and less surreal for it, enhancing the themes. And it's a massively entertaining thriller to boot!